When people like Matt Taibbi get angry at AMERICAN SNIPER I think what they're really angry about is the Iraqi war. I don't believe my country should've gone to war in Iraq after 9-11 but that doesn't have anything to do with AMERICAN SNIPER. This film is not pro-war propaganda nor is it mindlessly racist. Maybe the real Chris Kyle was all of these things are more. I don't care. What I care about when I'm reviewing a film is what I see on screen. And what I saw was a beautifully made, superbly acted film that had the courage to show the flaws and delusions of a simple patriot, and the grave toll that war takes on everyone involved in it. It's an intelligent and sensitive film and I wish people could just watch it on its own terms. The film opens in Iraq. Chris Kyle is a Navy SEAL whose job it is to take a high covered position and shoot insurgents as the marines go house to house. He's such a good shot that he's referred to as the legend, and he makes the men feel invincible. Chris doesn't regret killing any of the people he kills. Some think this makes the movie jingoistic but it doesn't. It doesn't judge him but shows us what makes a man of such certainty. It posits him as young boy willing to take the bible and patriotism on faith. Asked whether he questions himself he says no. He's happy to answer for those he's killed because otherwise they would've killed his men, and threatened his country. His single-mindedness is admirable but incredible. That's because it is, literally, incredible. We don't believe it, and increasingly neither does he. The shots become harder to take. When a young kid picks up a rocket launcher, Chris' duty is clear but he is begging for that kid not to do so. He's not impervious to the moral implications. And when he's home he can't switch off, he can't connect. He protests that he has no regrets but just look at the psychological toll it's taking on him. His injuries are paralleled by the physical maiming of the vets he tries to help on his return. What I took from AMERICAN SNIPER is this: Clint Eastwood isn't saying whether Chris Kyle's attitude toward the Iraqis was right or wrong. He's saying look at this kid, who was born and raised in America. Look at where earnest good intentions took him and what they did to him. Look at what the harsh price of defending our freedom, if indeed that's what we were doing, has done to our boys, and their boys, and the mire it has put us in. Look at how a real man can become a killing machine, look at his hero's death and ask yourself was that what he was, or was he just a poor misguided kid? The reason why I took that from Clint Eastwood's film is because Bradley Cooper gives me all of that in his performance. He gives me patriotic but rather unthinking self-assurance and naive bloody-mindedness. He gives me the broken and vulnerable and embarrassed man when an injured vet thanks him for saving his life. I may not agree with the war or empathise with that kind of patriotic certainty but I can admire the desire to be selfless and pity the aching suspicion that maybe the desire to be courageous is actually selfish. Because Bradley Cooper encompasses all that and more in this role. One last thing. People have been talking about the production aspects of this film, criticising the use of a fake baby rather than a real one, but to be honest I didn't notice that. What I did notice is that I left the movie dazed with emotion and convinced that in the final battle scene in Iraq, with men running through a sandstorm desperate to get out alive, I'd seen one of the most visceral scenes of urban combat on screen, and a profound metaphor for the war in Iraq. Anyone who can't see the complex reactions Clint Eastwood is trying to create in that scene - admiration for their courage, doubt at the mission, admission of the impenetrability of the problems - is deliberately and epically closing their mind to a great piece of cinema. 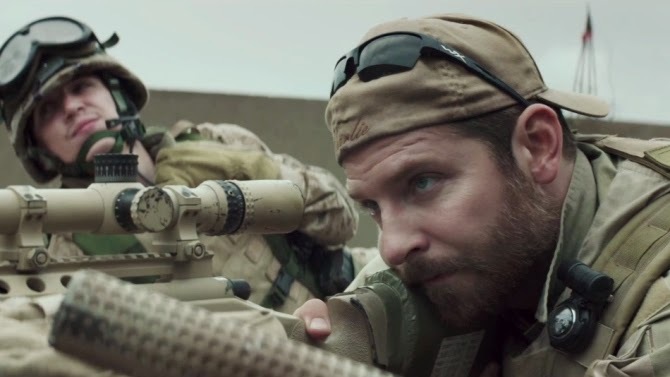 AMERICAN SNIPER has a running time of 132 minutes and is rated R. AMERICAN SNIPER went on release in the USA last year and opened in Italy on New Year's Day. It opens this weekend in the UK, Argentina, Czech Republic, Croatia, New Zealand, Peru, Slovakia, Bulgaria, Ireland and Kenya. It opens on January 22nd in Belgium, the Philippines, Australia, Denmark, Greece, Hong Kong, Portugal, Singapore, Norway, Romania, Sweden, and South Africa. It opens on January 29th in Colombia, on February 18th in France, on February 19th in Brazil, Hungary, Macedonia and Slovenia, on February 20th in Estonia, Spain, Lithuania, Latvia and Poland, on February 21st in Japan, on February 26th in Germany, on March 5th in the Netherlands, on March 6th in Finland, and on March 19th in Kazakhstan, Russia and Ukraine.